Wow....Really nice! I love the color theme. The scan is fabulous and I really like the tree behind the character. I love it so of course +Fav ^_^ Good work ! wow the wallpaper looks very nice, i like the background, the scene is very good, the tree there and the chara fits in so well. i love the background...look nice..keep it up! 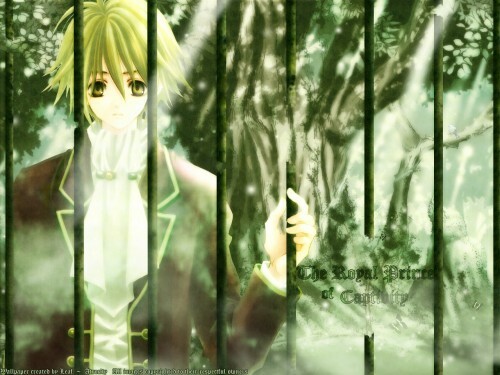 He's behind bars but behind the bars is a forest? this looks very pretty :D like the green colour theme. tree looks wonderful, also the shadows and darker green tones which it creates are nice. lighting comes nicely :) it really looks like sun shining comes from between the leaves of the tree. scan of boy fits well and blends nicely to bg. bars also look nice and agree with Machika that he looks like he is in prison. great work ^_^ thank you for sharing ! oh, that makes me feel really sucky.